As of July this year, Calderdale Council was predicting that it will suffer a funding shortfall of £6m this financial year, based on revenue monitoring. This is because of savage central government cuts to local authority funding. This is worst in northern and Labour councils. The first of two 40 foot containers was sent off from Rochdale to Aleppo in Syria on 22nd December. It contained warm winter clothes, food, medicine, medical equipment, nappies, etc – all donated by hundreds of people and businesses from the region. The second container will be going to Aleppo in early January. From April – October 2016, the West Yorkshire Sustainability and Transformation Plan Programme Management Office has been run by a private sector consultancy company called Attain, at a cost to the NHS of £377,976 for work. 12% of this will be Attain’s profit, according to its website. Attain’s Chief Executive, Martin Wilson, is a former partner in KPMG. The STP will be completed on October 21st – the deadline for handing it over to NHS England. 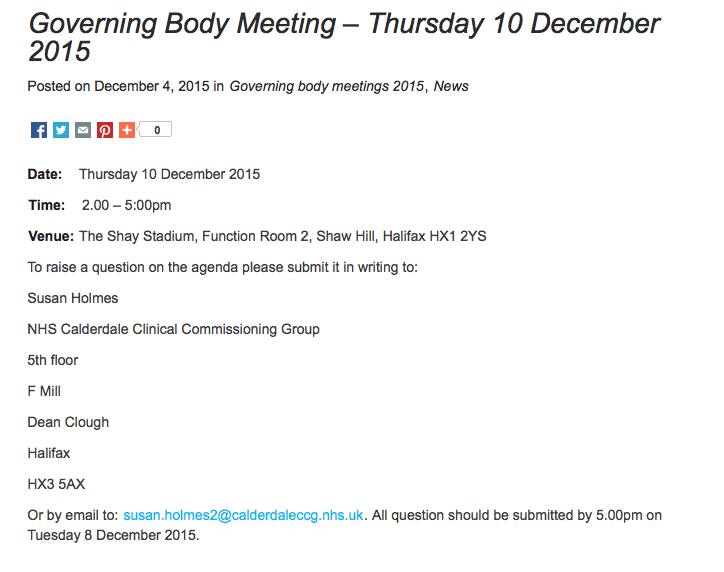 The agenda and all the papers for the Gov Body meeting are online here. Fatihul-haq, President of the Ahmadiyya Muslim Community Huddersfield South, whom Plain Speaker met at Huddersfield Planet Festival at the end of the summer, has asked us to pass on the word that the Ahmadiyya Muslim Community in Huddersfield utterly abhors the carnage that was carried out in Paris last Friday. The people murdered in the Paris atrocity will be remembered at services this Friday, 20th November, when prayers will be said in their memory at Mpsque Baitul Tauhid, Spaines Road, Fartown HD2. Special services will be starting at 12.45 and there will be one minute silence prayers. If you’re a Calder Valley citizen and want to keep the Human Rights Act (HRA), please tell our MP Craig Whittaker to join with pro- Human Rights Tory MPs and argue and vote against the government’s attempt to repeal the HRA. Here is a template for an letter/email to send him – obviously change it as you see fit.